Kernel for Tape is used to recover and retrieve data from all types of damaged, corrupted tape cartridges such as DLT, AIT, LTO, DAT tapes and formats. During recovery process a complete scan of the damaged tape is performed to locate and restore the found data. After the complete scanning the data found in the damaged tape is stored in a image file and the found files and folders are displayed in a tree like structure for recovery. For security reasons, you should also check out the Kernel Tape Data Recovery Software download at LO4D.com which includes virus and malware tests. Additional screenshots of this application download may be available, too. 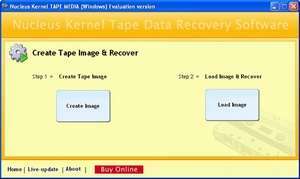 Kernel Tape Data Recovery Software download been highly rated by our users.